A little something to consider, regarding how some Confederates had turned lawless, even by this time, 150 years ago, in the Shenandoah Valley. Now, I don’t know about you, but the first thing that comes to my mind when reading something like this is the movie Shenandoah. For those who remember, there’s that scene where Confederate deserters (led by actor Kevin Hagen. You know… the guy who later played Doc Baker on Little House on the Prairie) come and do bad things to James (Patrick Wayne) and his wife, Ann (Katharine Ross). 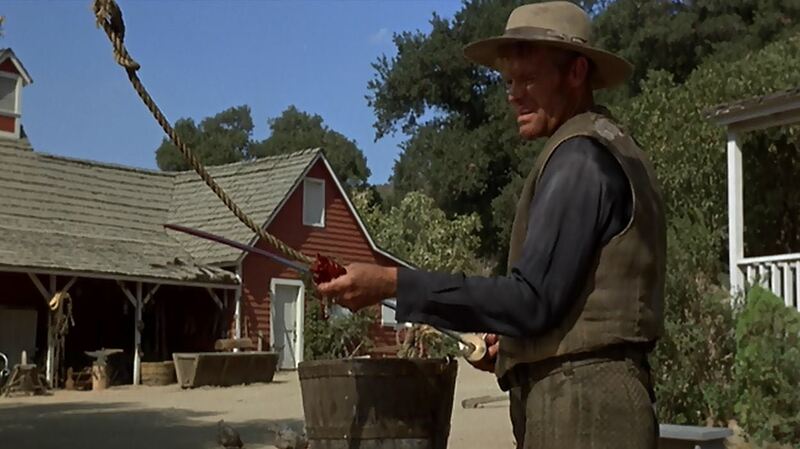 Kevin Hagen, as a Confederate deserter, cleaning his saber after running James (Patrick Wayne) through. I tried to do a little sleuthing to figure out the identity of the Longerbeam who was shot. The problem, however, is… was the article accurate? Was it really a Longerbeam, or was it someone else mistaken as a Longerbeam? It’s hard to tell. The best I could do was figure out who I can no longer account for, after the war (since this “Longerbeam” was shot in 1864). I checked the 1860 census, and found that all Longerbeams living in Virginia were concentrated in the tri-county area of Clarke, Jefferson, and Loudoun. Next, I turned to the service records and found just over half-a-dozen Longerbeams with service in the 122nd and 150th Va. Militia, 2nd Va. Inf., 33rd Va. Inf., 11th Va. Cav., and Carters/Chew’s Battery. There were indeed some who had records of desertion, followed by no record after the latter part of 1863. These Longerbeams sure seem to fit well into this story. On the other hand, I can account for one dying from wounds received in battle, and most of the rest dying well after the war. So, in the end I wasn’t able to find my answer. As a sidebar to that effort, however, I did run across one Abram/Abraham Longerbeam, who caught my attention. Born in 1818, I’m pretty sure he didn’t see any service in the Confederate army… and am not sure exactly how he was related to all the others who wore gray (an uncle, perhaps). In 1862, he and his wife had a son, and named him… Abraham Lincoln Longerbeam. Unmistakable, I’d say, in defining at least the sympathy of this Longerbeam.